WoW Pet obsession? Don't mind if I do! Taming Cataclysm #4: Uldum Showdown! 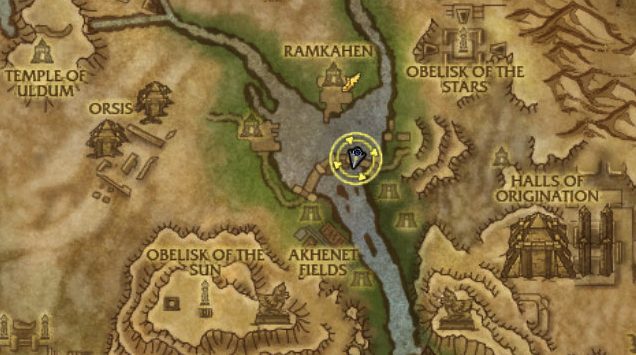 Uldum: Now this is what I call a nice vacation spot! One last Tamer and then you’re finished Taming Cataclysm. This is the only one of them that doesn’t have a portal straight back to your capitol city. But who wants to go back? It’s nice here in Uldum! The fight itself is the most straightforward of all of them, but it’s still tough simply because all three pets are stronger, faster, and have more hit points than yours will. Obalis is waiting for you! Obalis is a giant cat statute thing who was apparently left by the Titans to test the abilities of any would be Grand Master Tamers. Or something like that. The guy seems kind of confused to be honest. He might have just showed up a few months ago and only thinks he’s been around for eons. At least he gives a bag of goodies to anyone who beats him. Who cares about the backstory, just give me the shinies! Pyth is a typical snake, but he’s pretty dang tough. He has three of the usual attacks: Vicious Fang, which hits harder each time he uses it, Counterstrike which does Humanoid damage with extra damage if he attacks last, and Poison Fang which poisons your pet slowly over five turns. Keep Critters far away from Pyth. If you want to try and wear him down one-on-one, you’re going to need a tough and fast Mechanical or a higher DPS non-Mechanical. A dragonkin with a tail swipe (like Spawn of Onyxia) can do well as long as it is slower than Pyth and has a way to heal or avoid the occasional Counterstrike. If all else fails, there’s always the good ol’ Darkmoon Tonk! Spring is the anchor of this team, mainly because her high speed and avoidance abilities make it hard to actually hurt her. Her opening move is usually Moth Dust which has a 25% chance to put your pet to sleep, and it seems to happen more often than that. She then generally follows with Cocoon Strike which will block 1-2 hits completely. Finally, she attacks with the normal Flying attack, Slicing Wind, until her first two attacks come off cooldown and the whole thing starts over. Keep Aquatic pets away from her, obviously. Ideally, what you need to take her down is a Dragonkin that does magic damage, like a Nether Faerie Dragon, an Emerald Proto-Whelp, etc. A normal Magic pet, even an Ooze, will work well. 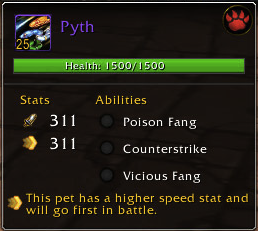 You could probably get by with a high DPS pet as long as it does non-Beast damage. Time any strong attacks around her Cocoon Strike and try and avoid getting hit by Moth Dust if you can help it. 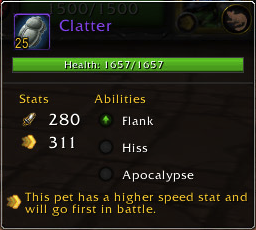 Clatter isn’t that tough, but he’s got enough health and damage that you still need to have a good pet up if you want to finish. Clatter starts out with Apocalypse which you can mostly ignore. He then goes into Swarm for three turns which does some damage and also gives you the Shattered Defenses debuff. After that, his Flank attack will hit for a ton and will hit even more if he is faster than your pet. Try to finish him off quickly and time any avoidance abilities to kick in after Swarm so that his Flank doesn’t kill your pet. A beast pet with a speed reducing ability, like a snake, is ideal. 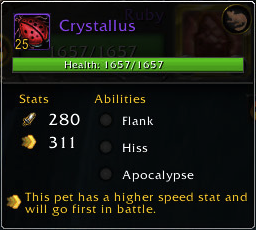 A pet with a shield ability is also a good choice. Any strong pet with a way to mitigate the Shattered Defenses debuff is what you need here. In summary, if you have the right matchups, you can get through the fight without too much trouble. Bad RNG can still sink you but if you pay attention to your abilities, it’s not that tough. Congratulations! You’ve just finished Taming Cataclysm!! 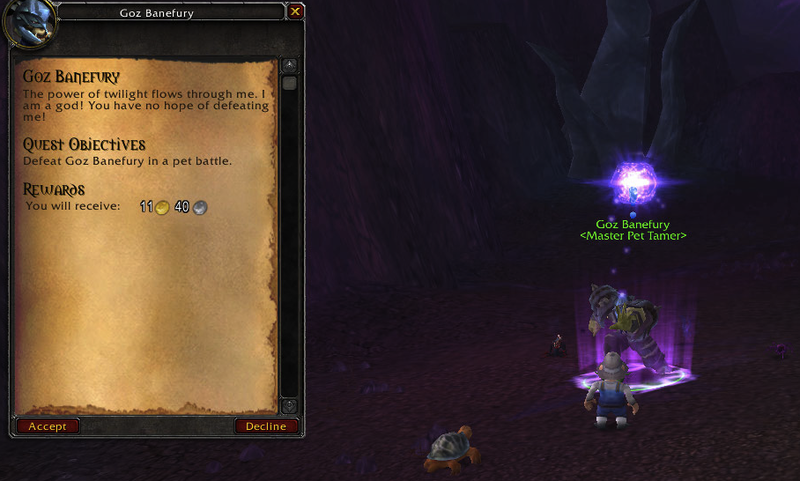 This pet battle can be a bit tricky to use for leveling purposes mainly because the pets all have huge stat bonuses, and none of them have any easy weaknesses you can exploit. 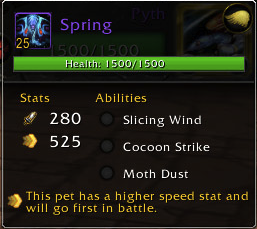 Also, you need to be careful opening with your leveling pet as the Poison fang may kill your pet, and the moth dust ability can one-shot lower level pets. 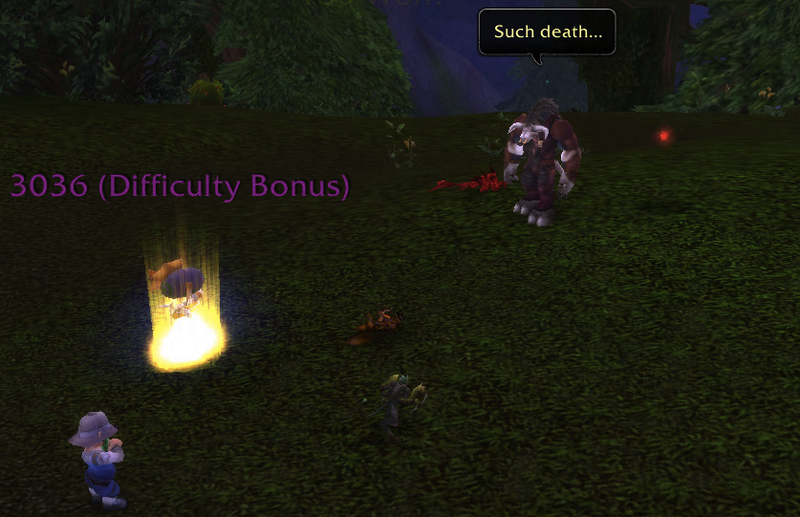 I’ve done well opening with a Darkmoon Tonk, though the Tamer will often pick the Moth first instead of the Snake. But that’s still okay as you can drop mines and swap to your Moth killing pet (which is a Dragonkin that does Magic damage). You can then bring your Tonk back to mine and finish off the Beast and your Dragonkin can (hopefully) kill the Beetle. I’ve also been able to handle it with a Spawn of Onyxia instead of the Tonk as the huge heal and Lift-Off abilities let it mitigate much of the damage thrown at it. I’m sure there are other combinations you can use, depending on your pet stable, but you’ll likely need a Dragonkin that does Magic or Beast damage in order to have an advantage against the last two pets. I don’t think a Flying pet with Mechanical damage exists, so it’s much harder to find a strong matchup to counter the Beast pet. In any case, if you have too much trouble using it to level, that’s likely because you don’t have the right matchups. A good excuse to level another pet! And it’s still worth doing the daily because of the chance to get an upgrade stone from the pet supplies bag. Twilight Highlands? More like Twilight big ugly Crater-lands! So yeah, this next guy is fun. And by fun, I mean completely unhinged and carrying around a pack of pets that are equally weird. At least the Stable Master is close on Alliance side. Whatever Dude, do you wanna play some WoW Pokemon or not? Also, Banefury seems to think he's some kind of god. Let's put that to the test! Meet Twilight. She’s totally chargin’ her Laz0rs and stuff. Twilight is an Elemental with some weird abilities. Her main attack is a Magic ability called Laser which does a fair bit of damage and “never” misses. She also has an Elemental attack called Darkflame which hits pretty hard, is on a moderate cooldown, and gives you a debuff that reduces your healing by 50% for two turns. You want to try and mitigate this if you can. She’s gets knocked down, but she gets up again! You’re neva gonna keep her down! Her last ability is called Dark Rebirth and you really need to pay attention to that. Basically, if that ability is up and you kill her, she comes back to life with full health which she burns through over a few turns. To keep from triggering that, don't damage her when her health is low until the ability has been used up. 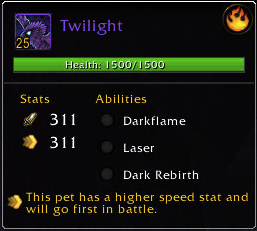 Avoid using Flying pets against Twilight. 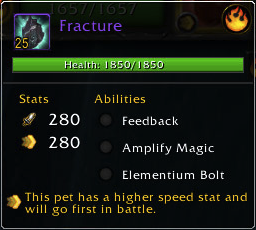 If you have a mechanical pet that doesn't do Mechanical damage (like a Mechanical Pandaren Dragonling) you can do pretty well as long as you time you avoidance abilities around Darkflame. A pet with good heals and avoidance, like a Spawn of Onyxia, or a snail pet can also do well. Amythel is another weirdo. He's a Magic pet whose main attack is an Undead ability called Creepy Chomp. He also has an attack called Creeping Ooze which does damage over time and increases the damage your pet takes by 25%. His last ability, Adrenal Glands, increases his critical strike by 50%, but also reduces his chance to hit by 25%. So it varies alot how much this helps him. It does give you an extra turn to attack though while he is applying the buff. Your best bet with this guy is any pet that does even moderate Dragonkin damage. It's much easier to burn him down than tank him as he doesn’t have any avoidance abilities. Also, it’s probably not a good idea to use Humanoids on him. Wow, I’ve never seen that before! Helios is a typical spider pet. He has Brittle Webbing instead of Sticky Webbing so you can swap your pet if you need to. Mechanical or Flying pets are best. Avoid using Humanoids, Critter pets, and pets with swarm or flurry attacks. In summary, this fight really revolves around how well you do against the Elemental. If you can get through that with most of your team still up, and don't trigger the Dark Rebirth you should be in good shape to finish. Best two out of three? 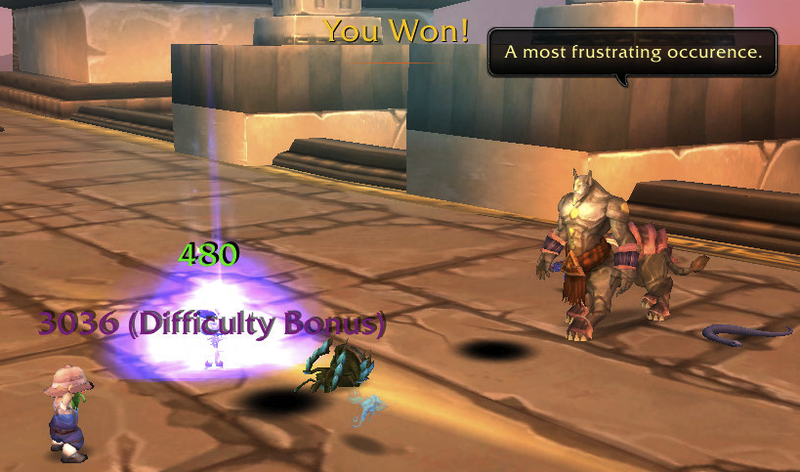 This fight is relatively easy to use for leveling, if you have the right Mechanical to take out the first pet. 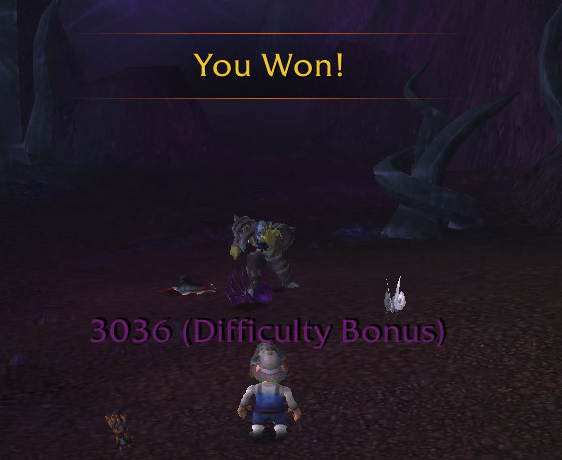 Ideally, a Mechanical Pandaren Dragonling with Decoy, Dragon Breath, and Explode. Other pets will also work, but it may take some testing to find out what works for you. The second pet can be a Flying pet with Cocoon or Lift-Off or a Dragonkin with some heal or avoidance abilities. 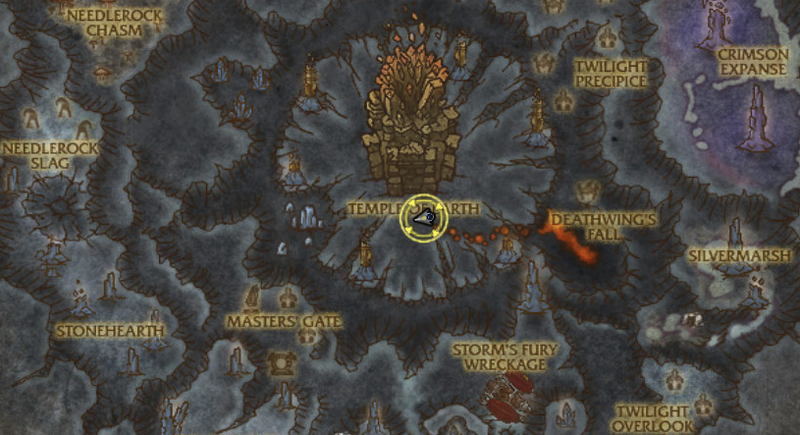 Your leveling pet should probably be swapped in later, rather than opening with it, so it doesn’t get hit with an opening Darkflame and killed. Try and time your first pet's avoidance around Darkflame. Burn Twilight down to one hit and then wait to finish until Rebirth is triggered or you have a killing blow (if your pet is faster). If you're using the Dragonkin, burn down his Magic pet next. 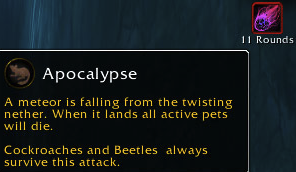 Otherwise, you might swap for your second pet and save your first pet's abilities to finish the spider. It's really up to you. The hardest part of this is getting through that first pet with a decent amount of health left. After that, it's relatively easy. Here be rocks and stuff! And again, the tamer is right next to the portal for maximum convenience! So Deepholm isn’t all that bad. Once you get used to the rocks and stuff you’ll find alot of interesting pets. And everything is set up right near the exit so it’s perfect for farming. But trust me on this, don’t even try and catch a rare Stowaway Rat. Sure, you can pick up a rat as a secondary with almost every fight, but you’ll never find a rare one. He’s just this guy, you know? What do we know about Bordin Steadyfist? 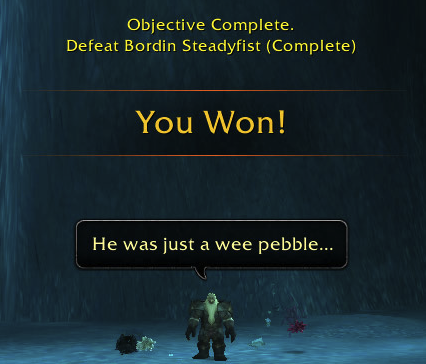 Well he’s this dwarf that likes to collect rocks. And battle with them. I guess that’s what you do when you’re stuck in this realm of walking, talking, and very patient, giant rock things. He’s a bit tougher than the last guy, but not much. Ruby wants to hit everything! Even herself! Ruby hits like a truck. Then she gets abilities that let her hit even harder. But she’s a bit emo and will /hurt herself first. Is that like an emo band for stone elementals or something? Her first ability is Crystal Overload which makes the next attack do double damage, but also do some damage to herself. Then she uses Stone Rush which does a ton of Elemental damage but also damages herself. By then, there’s a decent chance you’re dead, but if not, she might do some more Elemental damage with Spark which hits a few times (extra if she attacks first). Then she’ll likely start the Crystal Overload + Stone Rush cycle again. While the first choice that comes to mind when fighting an Elemental is to break out the Aquatic pet, you’re not gonna be able to heal through her attacks here. 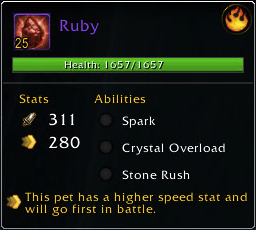 You might be able to out damage Ruby, but your best choice is to break out a Critter pet with damage reduction/avoidance abilities. My pet of choice is a Rare speed-breed, Brown Marmot that I caught before I had even heard about breeds. All I knew was it was faster than anything else and kicked some major tail. With Crouch and Burrow it can handle the first two pets almost by itself. Meet Crystallus. Are Crystal Beetles really a sign of the Apocalypse? Apparently so! Crystallus is much less annoying than the other two pets. Other than that whole summoning the Apocalypse thing. Summoning the Apocalypse? Is that a thing now?? Just like the one that was supposed to hit in 2012, or 2000, or whatever, you can safely ignore the Apocalypse he summons here. There’s like a 5% chance of being killed by it even if the fight does last that long. If you actually get killed by it and lose, then RNG just has it in for you. The other abilities he has are slightly more annoying, but throw any good Beast damaging pet at him and he’ll fold pretty fast. Meet Fracture. He’ll BREAK you. Like Schwarzeneggar in that one movie! Or that other movie! Any movie really!! Fracture is meant to throw in a curve ball, since he does Magic (with Feedback) and strong Dragonkin damage. But he’s really not that different from any other Elemental. Just throw in a high damage Aquatic pet, or any non-Flying pet with a good damage avoidance ability. Time your avoidance around his Elementium Bolt so you miss out on the huge damage + stun, and you’re good. In summary, this fight is more of a test to make sure you have a deep enough pet stable. If you have the “right” pets and use their abilities in the right place, it’s not too tough. Otherwise, it’ll be tough to pull out a win. Don’t worry, you can’t throw a rock around here without hitting, well, another flaming rock. This fight can be tricky to use for leveling purposes if you don’t have the right pets, but it’s still very doable. 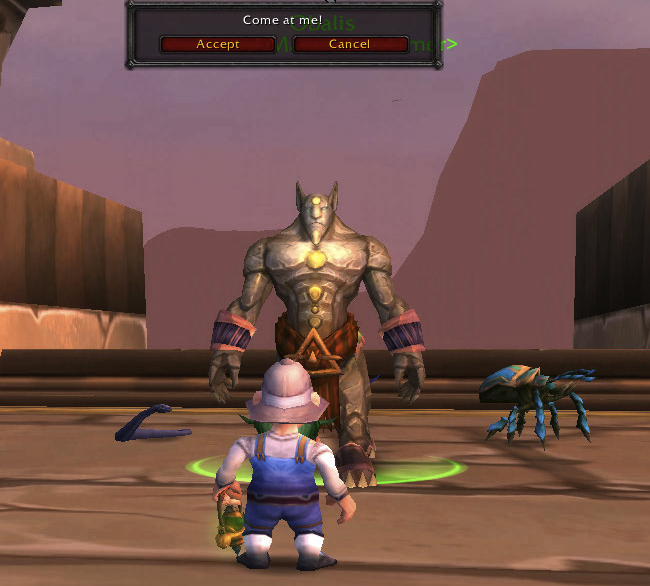 You can lead with your leveling pet, as the tamer usually starts with a self-buff, or you can try and weave it in later. 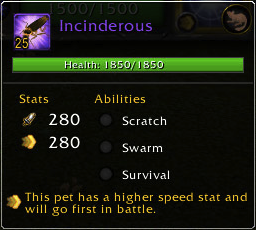 Your first level 25 pet should have strong avoidance abilities. A critter, especially marmot or prairie dog type is perfect. A snail is also excellent. I’m sure there are other pet types you can try, but that’s what works best for me. 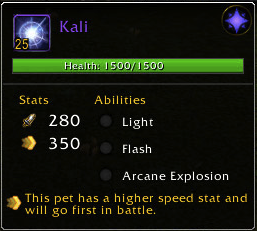 Your second level 25 pet should do strong damage against Elementals without being weak to Critter attacks. If it has a good avoidance ability that can also help. Turtles, another fast Critter pet, like an Armadillo or Marmot, are good. A Mechanical Squirrel, or other Mechanical with a Beast attack, would even work well. Fortunately, the stable master is close enough, that if you need to use some trial and error to figure this out, you can. Taming Cataclysm #1: It’s Nordrassil Time! The Happiest Place in Azeroth! 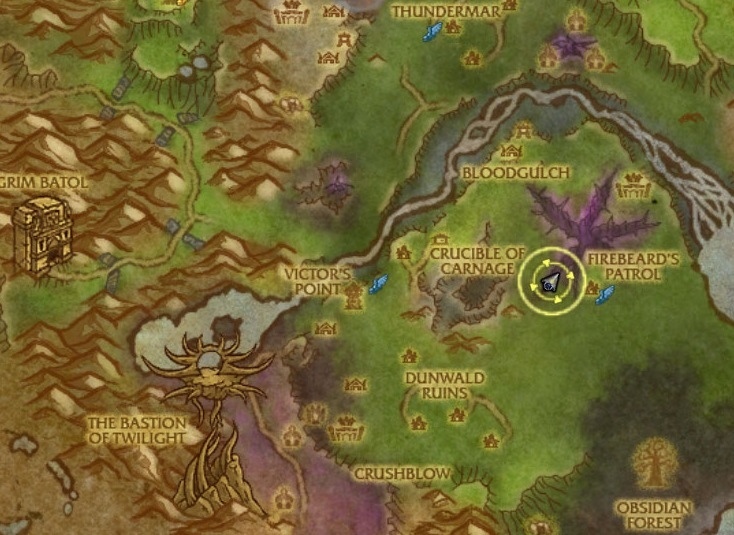 So if you’re keeping track, there are only four more tamers left, and then you can take on the pros in Pandaria. Kind of exciting, eh? Did I just say ‘eh’? Really?? Whateva! It’s safe to say that Blizzard has taken off the training wheels and is making you work, at least a little bit, for each of your victories from here on out. 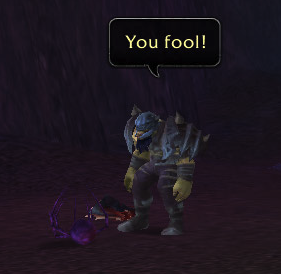 I hope you picked up some good pets in Northrend, because you’re gonna need them! Meet Brok. He’s here doing “research”. Whatever. So again we’ve got the Tamers trying to pass off what they’re doing as “research”. It’s like a special super-sekret tamer club! And no, I’m not cool enough to join. Instead of the usual Mad Scientist-type, we’ve got a nature loving Tauren named Brok who’s decided the best way to help the troubled wildlife is to capture them and make them battle each other to the death. It still sounds like the plot to some Sci-Fi B Movie if you ask me. And I don’t even want to know what else he’s got planned for the Double Feature. Meet Kali. A cute little Nightwisp… of DEATH! Kali is a cute little Nightwisp with some tough abilities if you’re not prepared for them. First Kali will Flash at you which does a small amount of damage and then Blinds you. Then she shines a Light in your eye which hits for a large amount of damage and will do double damage if you are Blinded. Then for three turns she does Arcane Explosion which will damage all of your team for a small amount. This is all Magic damage. Obviously, avoid using Flying pets and pets that do Aquatic damage. She’s not that tough as long as you have a Mechanical pet, a pet that does Dragonkin damage, or a pet that can consistently avoid her Flash attack by either blocking it or using something like Deflection to dodge it. Just remember, the faster you kill her, the less damage the rest of your team takes. He’d gnaw your face off if he were just a wee bit bigger! Ashtail is a pretty standard Beast, but his main attack, Quick Attack does critter damage. This ability allows him to ignore speed differences and attack you first. So avoid Flurry and other similar abilities. He generally saves Comeback for when his health is low, as it does extra damage then, and he weaves Triple Snap in there occasionally. A Mechanical is good against him, obviously. A Flying pet will lose the speed advantage and the damage reduction it usually gets, though a Humanoid that does non-Humanoid attacks (like a Flayer Youngling) would do okay. 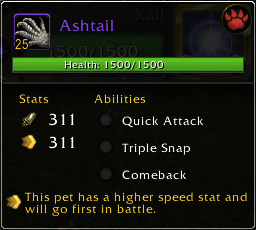 Avoid using Critter and Undead pets against Ashtail. Incinderous is pretty tough for a tiny little beetle. He has the standard Critter attacks, Swarm and Scratch, and he also triggers Survival which you’ve undoubtedly seen before. Mainly though, he just has a really big health pool and can wear you down if you’re not careful. Avoid using Undead or Elemental pets on him, and stick a Beast on him if you can, and you should be fine. In summary, this is no Major Payne. As long as you come prepared you should be okay. Also, it’s right next to the portal and a Stable Master, which you’ll come to appreciate if you start doing this as a daily. I’d like to think this was unnecessary, but the amount of health these pets have makes all these fights non-trivial if you want to use them for leveling. You can use even a low level pet on this fight, though you have to kill the Nightwisp eventually or it’ll take too much damage and die. You can even lead with your leveling pet, and avoid one Blind + Flash cycle, though that might throw off your rotation depending on which pet you use. My first thought was to just stick a Mechanical on Kali and power through the (greatly reduced) damage. This works great with a Mechanical Pandaren Dragonling but less good with other Mechanicals. What worked best for me was to stick a Flayer Youngling on it and time its Deflection ability to avoid Flash. I had hoped that this would be the one time its Focus ability was useful, but you still get the Blinded debuff and take the extra damage. The last two pets do a pretty strong amount of damage as well. I used a Mechanical Squirrel with Thrash and Windup and tore through the last two pets. Any pet that does decent Beast or Mechanical damage (or both) should be able to finish those last two. I’m sure there are multiple ways to do this with two pets. Just remember that it’s best to avoid the Flash if you can. Also, remember to swap your leveling pet in there at some point!